He’s in the center of a room surrounded by a group of female Eritrean immigrants at a safe house in Austin, Texas. Six of them sleep in the small room. Some are braiding each other’s hair while sharing with Ross the story of their dangerous and life-risking journey to the United States. Ross stands awkwardly in the middle, and it’s clear he’s a comedian disarmed. On it’s own, the immigration debate isn’t something that makes people laugh a lot these days. But, in that, Ross saw an opportunity to dig into the truths of the people whose lives are affected by the policies being talked about by using the sharpest tool at his disposal: his comedy. That’s the reason, Ross says, that “woke comedy” or “activist comedy” is on the rise. It’s an opportunity for unfiltered truths, delivered as palatable jokes. Jokes make the truth go down easier, if you will. In the special, which primarily includes footage from his time in Brownsville, Texas, a town on the frontline of the immigration debate, Ross dives into an issue that remains front of mind for many as the Trump administration takes steps to reform U.S. immigration policies. In September, the Trump administration announced the end of DACA — a program that had protected nearly 800,000 young undocumented immigrants from deportation who were brought to the U.S. as children. Trump has also expressed a desire to end the Diversity Visa Lottery program and was elected on a promise to build a border wall between the U.S. and Mexico. While researching for the special, Ross looked into many of these programs and admitted to feeling exasperated at times. In his special, Ross speaks to residents of a town that is already home to a wall meant to curtail illegal crossings, law enforcement who are witness to a daily influx of immigrants, and even some people fresh from their journey across the border, including a father-son pair and a pregnant woman. Not all the people he interviewed for the special left Ross at ease, however. At one point, a person who smuggles people across the border, called a coyote, describes to Ross what he does to people who can’t pay him after enlisting his services. “Sometimes, when people don’t pay and stuff, you have to hold them for a little bit,” the man, whose face is hidden, says. This includes children. Ross’s attitude takes a turn in that moment, and he asks the coyote how he sleeps at night. Inside, “I was actually thinking, ‘How the hell do I get out of here alive? '” Ross said. He did, and Ross also emerged from the whole experience with a new outlook on what once seemed like a complicated issue. 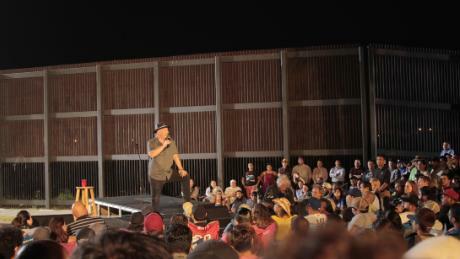 “Jeff Ross Roasts the Border: Live from Brownsville, Texas” airs Thursday on Comedy Central.